James C. Michael was born on March 19 1863 at Morgantown West Virginia. He grew from a “pioneer boyhood,” in that he attended a log school until he was 16 years old, and claimed he used to hunt squirrels with a “muzzle-loader.” He worked as a teacher prior to graduating from the University of West Virginia in 1883. He moved to Red Wing Minnesota in 1885 and practiced law there until he moved to St. Paul in 1889. In 1891 he married Jennie Crandall of Minneapolis. 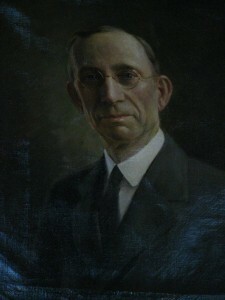 He served as Corporation Attorney of the St. Paul from 1903-191. He was appointed to the Ramsey County District Court in 1915 following the creation of an additional judgeship for the St. Paul area by the Legislature and Governor. Judge Michael served in this capacity the rest of his life. Among the cases Judge Michael heard involved a state suit involving nearly $50,000,000 against the Great Northern and Northern Pacific railways for taxes allegedly due on stock of the Burlington Railway for which the two companies jointly held control. Judge Michael ruled the assessment illegal, which was later upheld by the Minnesota Supreme Court. In 1921 the City Railway Company tried to instill a 7-cent street car fair, which was attacked as “having been decided without sufficient justification” in hearings before the State Railway and Warehouse Commission. Judge Michael sustained this conclusion, and was affirmed on appeal. Judge Michael died on March 12, 1946 at age 83, thus ending his 31 year term on the bench.